...is really French...French Provincial to be exact. ...good bones, but in need of a cosmetic makeover. I must confess that I have no idea what I was thinking when I bought it. My prior stool project was a disaster and one I dubbed "how to ruin a piece of furniture in 5 easy steps or less". If you don't believe me, let me refresh your memory, click here! Since I was a bit intimidated, I let the stool sit in the garage....lonely and unloved during our move and for weeks after. It called out to me, but I ignored it. I even had the hubster put it on a shelf far above my eye level so I wouldn't have to look at it. Finally, I couldn't stand knowing it was there, unloved, and decided to take it down and begin the process of reformation. I didn't want to paint over it because this pink paint was in bad shape...lots of chipping. Sanding it off wasn't an option either because I didn't want to damage the wood. I opted for stripping off the old paint with CitriStrip Paint Remover. It was a pretty easy process...until it came to the decorative emblems. Lots of gentle scrubbing involved there. 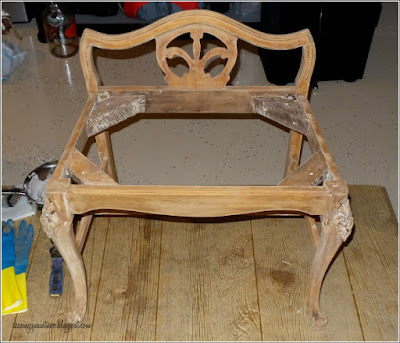 After getting all of the old paint off the stool, it had a red tint to it so I decided to age the wood using the apple cider vinegar process. My original thought had been to leave the wood natural. Since I didn't want to leave it in its current state, I decided to paint it. 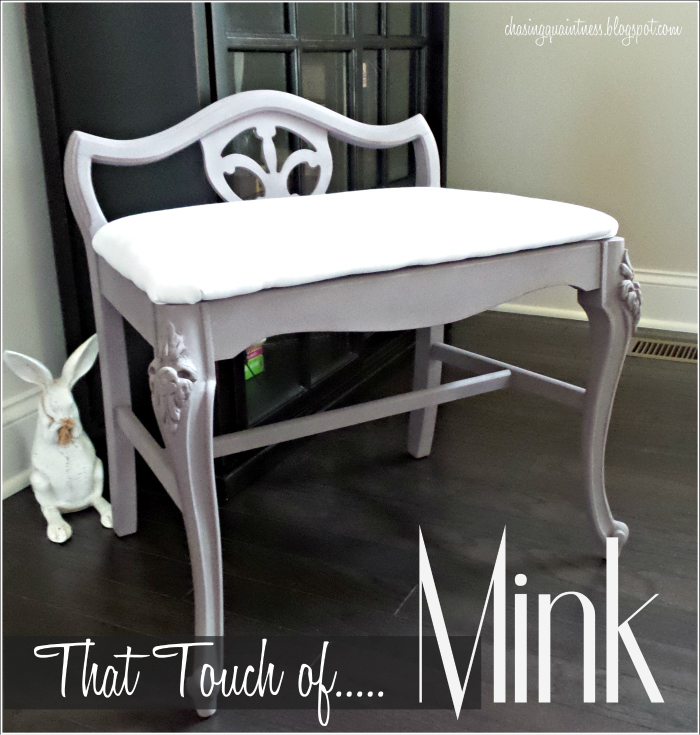 I found a wonderful color in Krylon chalk paint....Mink. I suppose if it were wall paint, it would be named "Greige", as it is a pretty grey/beige color. While the hubster worked on the spray painting technique, I worked on the seat. I had just had my nails done and didn't want to get spray paint on them...yes, I could have worn gloves, but he does a much better job in the spray painting department than I do. I purchased new cushioning for the wooden base and covered it in a fabric similar to the fabric on my sofas....which I suppose really didn't matter since this little stool will be hiding in my bedroom closet. BUT, if it ever chooses to come out of hiding, it will not need any changes. Even though it took about a week to complete this project, I'm glad I decided to strip the paint and get to the bare wood before painting it. While I would have been fine with the "chippy" look, I think it looks better with a smooth finish. And who knows, 2 months from now I may decide to change the color and will want a smooth head start....but shhhh, don't tell the hubster! Your little chair looks great. I'm glad you're having some time to enjoy at home. 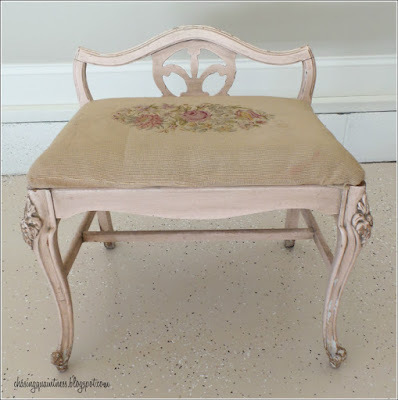 Such a darling little chair and I agree the smooth finish sets it off just right! Thank you so much Jemma! I think it does it justice also! ;-) Hope you have a fabulous week and are getting settled in the new house! Hugs!! Good Monday Morning Benita. I love your sweet little chair. I like the smooth finish on this piece too. Yep coming from Miss chippy here but I think the style of the chair and the pattern look great with the smooth finish instead of chippy. Glad you re loved her into a new and pretty piece. Have a great week. Thank you so much Kris! I love the chippy look also, but just couldn’t seem to make it work (in my head) for this chair. So stripping it down seemed like the best thing to do! Hope you are having a great Monday! Hugs! It is a beauty Benita! Good job! What a sweet chair! Why are you hiding it in your closet?! Show it's beauty and your hard work off...the hubster's too! Thank you so much AnnMarie! She’s in there because until the holidays are over, I have nowhere to put her. She’s such a sweet little thing, I do hate keeping her in the closet. Thank you so much Donna! The hubster likes the "brown" wood look also and doesn't understand why furniture needs to be painted...LOL. Fortunately, he did see the need with this piece and agreed to handle the spray painting for me. 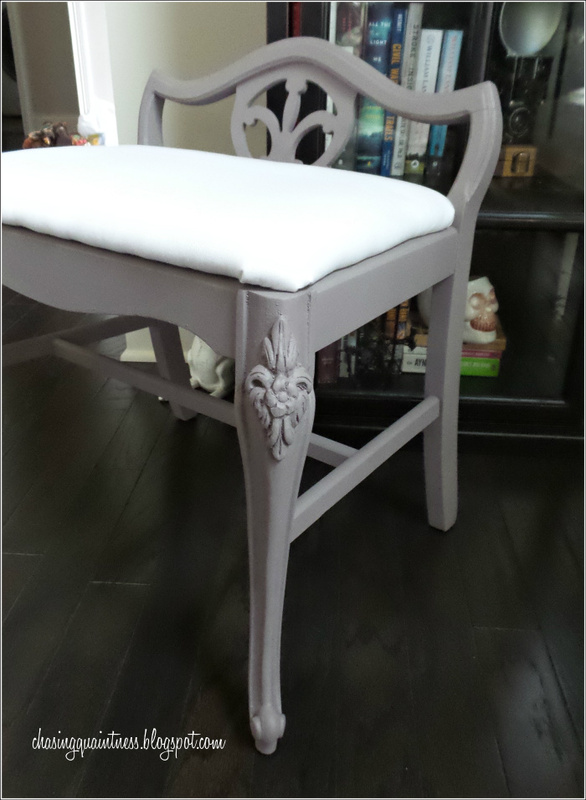 The stripper was wonderful and so easy to use...and it was perfect for this little chair...not harsh at all! I hope to be able to bring her out of the closet once the holidays are over. The living room is out of whack right now because of the tree, but when the dust clears, I hope to be able to put her by the fireplace. Sweet little thing! I would have grabbed it up in a heart beat! Thank you...she is a sweet little chair. I just had to have her when I saw her...she was so sad looking...LOL Her seat wasn't even attached. Thank you for saying so, but I’m faking it…believe me. :-) Most of the time, I have no idea how to go about these things and it is through a lot of error that anything happens…LOL I hope to find a place for her once the holidays are over….everything is just rearranged right now. I love the color you chose too, very pretty! Hope your week is off to a great start also! Hugs!! I just cannot make myself paint something and then "make it chippy." Goes against my grain. I have been meaning to tell you that I like your new header. Where did you find it? 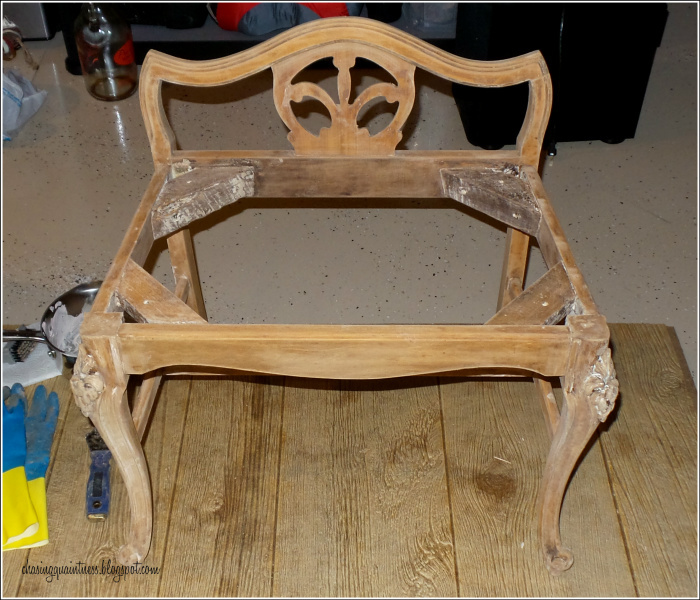 I love the chippy look for some pieces of furniture, but knew it would not work for this stool….so smooth was the way to go! Thank you ma’am! I bought this huge package of stuff last week that all different design element pieces in it….probably 500 different things for $39.00 from Creative Market. The art piece was included and I pulled it into befunky or ipiccy (I can’t remember) and added the font. I needed an little fresh update and will be making a few more changes probably. Your Frenchy stool is adorable! I love how you cleaned it up and breathed new life into it. Nicely done! Such pretty carving! This is a sweet little piece and a great find! Thank you so much! 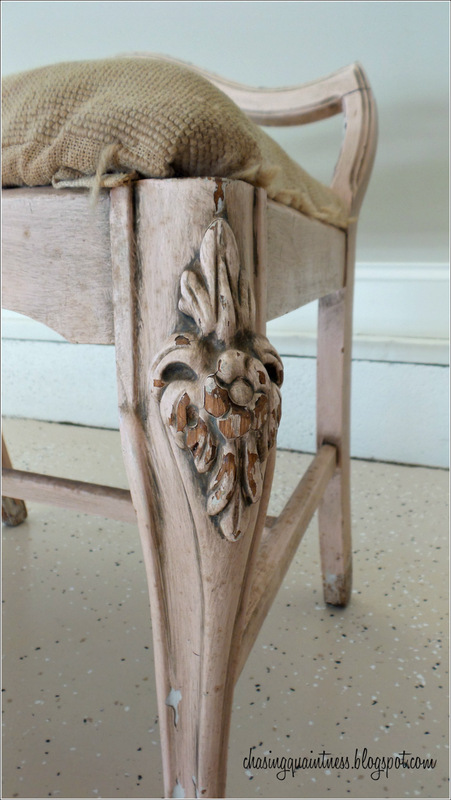 Those carvings were one of the key things I liked about it….such a sweet piece! :-) Hugs!! 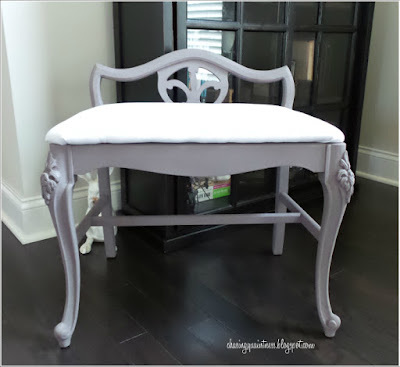 Girl get that lovely stool out of the closet … as soon as you find a dressing table to go with it! I cannot think of many things quainter than a dressing table can you? It is time to start “Chasing Quaintness” - get on CL and start the search for a dressing table to go with it. You had to give up the dream of a dresser vanity and here is your chance to go one better! I think every girl deserves a Dressing table that they use every day - they are so decadent you cannot help but feel as special as you are every day you sit at one! Check out this similar one from Larissa at Prodigal pieces. Thank you so much! I'm with you, I love dressing tables, but right now, we have no place to put one! I so wish I did. Our bedroom is so much smaller than what we had before. We have a bed and chest of drawers and 2 side tables...tiny space...LOL I love her dressing table and that chair!! I follow her on IG and love her home! Thank you! Omgosh…you are so right…that would be adorable! Okay, now I am really going to have to change the cover on this stool! Thank you!!! Hugs!! This is so pretty. I am glad you decided to give it some love. I have a vanity chair that I use in my master bath that needs some attention. Maybe I will get to it after we get in the new house, now that you have inspired me. Great job on your stool. Thank you so much! It was in such sad shape...LOL. I wish I had space in our bathroom or bedroom for this chair, but both spaces are much smaller than what we had previously! So looking forward to seeing that new house!! What a cute bench and love the faux fur and been thinking I need to go get me some! It reminds me I have a similiar one downstairs..question is, where to put it! Thank you so much! I’ve been wondering where I can put mine after the holidays are over! I really do hate keeping it in the closet! You know your stuff, girl! I can see you have experience with wood stripping and staining. I think it looks fabulous and I love the fabric. Its a beautiful piece and I hope it takes center stage somewhere in your home (or you can send it here...if and I mean IF I can find room!). Thank you so much! I do know how to strip...furniture that is! ;-) I'm just not good at repainting furniture. That's why I let the hubster do it. I'm hoping I can bring it out of the closet after the holidays! Hugs!! Good afternoon….mmaaannn, where did the last 2 days disappear to??!! :-) Thank you so much! LOVE that quote!!! I will have to remember that…and Bette Davis…definitely an intimidating presence…LOL. Thank you again so much! Hugs!! Love that Mink color. Great job on the redo. Loving it. thank yous here! are you supposed to put an apostrophe after the u? it looks like joey on friends is saying thank youse! wot you doin'? i've been on a wonderful whirlwind trip with the marine to see his two grandsons in georgia! WOW! do you ever live in a beautiful part of the country. Tennessee was as equally BEAUTIFUL! it started getting gorgeous in alabama. rolling mountains pine forests... winding highways... just wonderful. and i have come home to a DEAD EMAIL program. don't ask me. if I haven't responded... THAT'S WHY. can you tell i'm MAD? mad in both the british and the american sense. I can receive them. just can't ANSWER them. AAAGGGHHH! suddenly. just this afternoon. ah well. calm down old lady. this too shall pass. maybe right into gmail instead of what i've got now... a 2007 microsoft program! LOLOL. please delete this novel here. just had to tell youse here since i can't email. Thank you ma'am on the stool and no, no minks were killed...LOL. I do hope you are able to get your problems fixed soon! Love and hugs to you Miss T! !